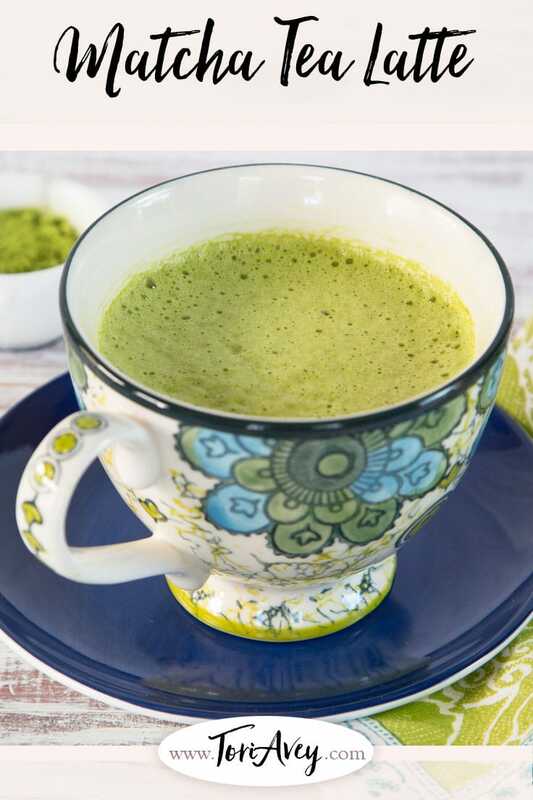 Matcha Green Tea Latte Recipe – Japanese-Inspired Latte with Healthy Green Tea and Dairy or Non-Dairy Milk. Legend claims that Shennong, the ancient Chinese emperor and inventor of Chinese medicine, discovered the lovely flavor and medicinal powers of green tea when a few tea leaves blew into a kettle he was heating over a fire. Powdered tea, like matcha, first appeared during the Song Dynasty (960-1279), when fresh tea leaves were steamed and then dried, ground and packed into hard cakes for easy transport. Whenever anyone wanted a cup of tea, a piece of the cake was broken off and dissolved in water. 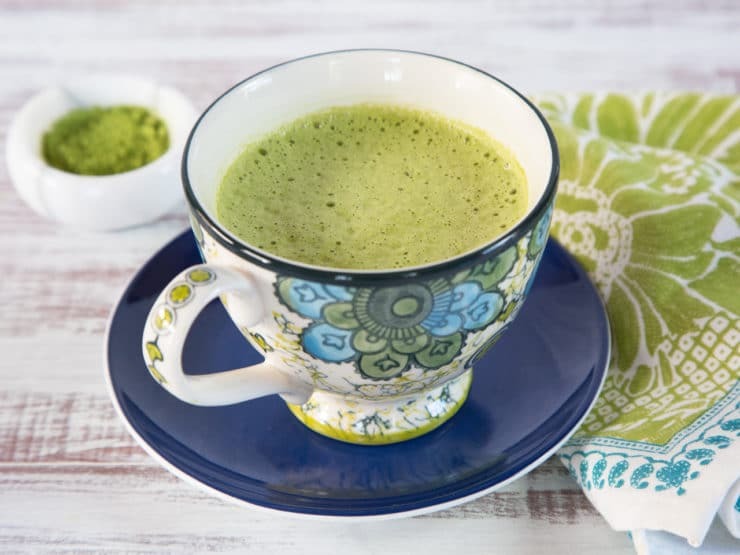 This practice eventually died off, though a slightly similar preparation reappeared during the 8th century, when Japanese Zen monks began growing their own green tea leaves and preparing powdered tea, now known as matcha. Due to a thyroid condition, I’ve been experimenting with less caffeinated replacements for my usual cup of black tea or coffee. I’m super addicted to my morning cup of joe, so finding an alternative has been pretty tough. I’ve been drinking green matcha in iced tea form for a couple of years now. Over the holidays I bought myself a gift– a new milk frother that heats and froths milk at the touch of a button. Using my new frother, I perfected the art of the matcha latte. Matcha gives you an energy boost without the crash you often experience after a strong cup of coffee. 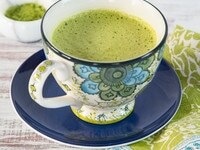 The matcha latte is a surprisingly perfect marriage of tea and creamy milk; when lightly sweetened, it is truly a treat. I recently found a great organic matcha, and I’ve been making lattes with it almost every morning. You’ll notice the high price point on this tea– the best matcha, known as “ceremonial grade,” is quite expensive. If you have the means to buy it, it’s worth the spend, especially if you enjoy matcha tea on its own (meaning, plain matcha tea– not the latte form). However, there are also some less expensive “culinary grade” matcha alternatives out there that are pretty good. Here is one I’d recommend; it’s not quite as flavorful as the ceremonial grade, but for mixing into lattes and baked goods, it does the trick. You’ll get quite a bit more tea for a slightly lower price than the small tins of ceremonial grade matcha. A matcha latte is a unique, simple and slightly exotic treat. While I haven’t completely been able to ditch my morning coffee, I have cut down substantially thanks to this latte alternative. Feel free to use any milk or non-dairy milk you like and adjust the amount of sweetness with sugar, agave, honey – you name it. The types of leaves used to make matcha are grown in the shade, which aids in producing more chlorophyll – so don’t let the bright green color throw you off. Remember, greens are good for you! Beauty shots and styling by Bethany Nauert. 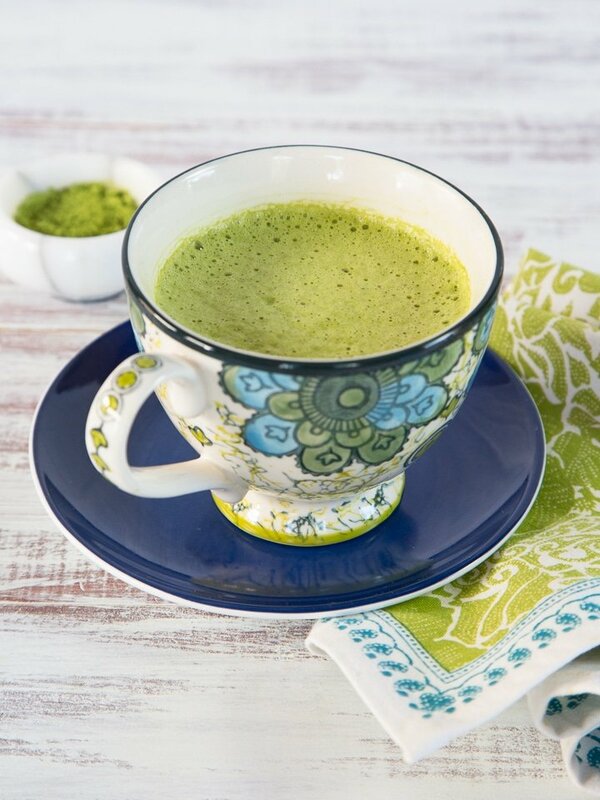 Japanese-Inspired latte with a healthy green matcha tea base, light sweetened with dairy or non-dairy milk. 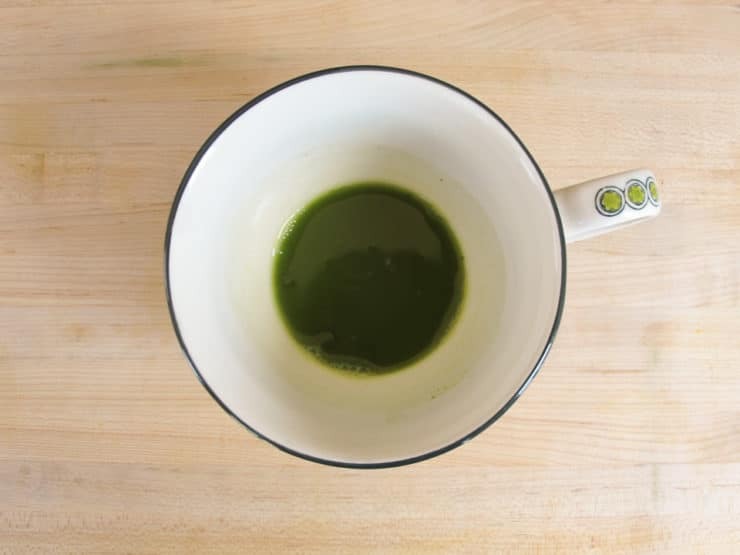 Pour the matcha powder into a mug along with 1/4 cup of hot water. Let the tea "bloom" for 1-2 minutes, whisking rapidly to break up any small pieces. For this you can use a wooden matcha whisk or a small metal whisk (a matcha whisk works best). 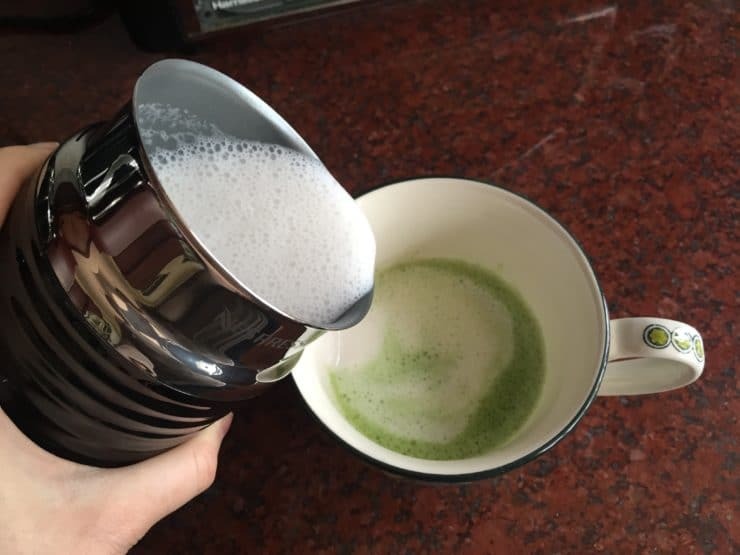 If you have an automatic milk frother, add the milk to the frother, heat and froth the milk, pour it into the bloomed matcha and sweeten to taste. 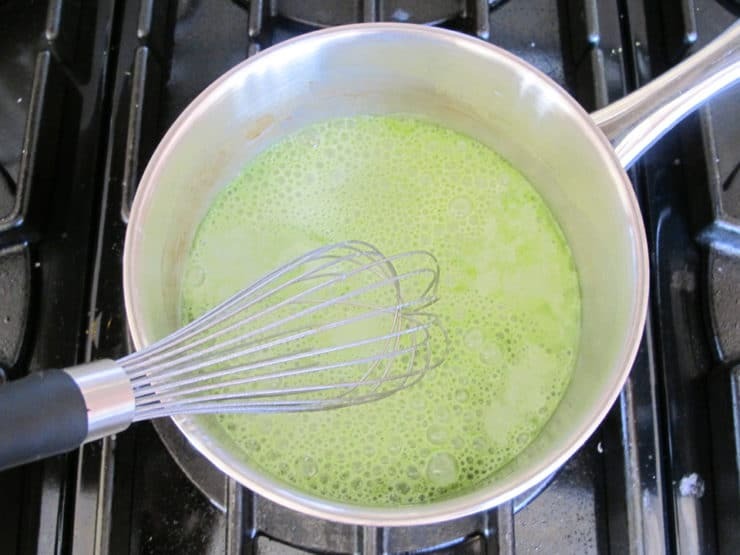 If you do not have a frother, add bloomed matcha to a small saucepan with the milk and sugar or sweetener. Heat until mixture bubbles around the edges, whisking constantly. If you prefer a frothy latte, use an immersion blender to carefully whip up some foam after it's done heating. Pour into a large mug, serve and enjoy! Adjust the sweetener to taste. This type of latte tastes best lightly sweetened. I have been wanting to use matcha tea for a while and finally bought some. Then I realized I didn’t have a way I knew how to make something delicious. I found this recipe for a latte and I have been hooked ever since! I was afraid a latte recipe was going to be too involved, but this isn’t at all. It’s very simple and easy. If I want it in the morning, but I’m in a hurry, I can still manage to make this. I use almond milk and it turns out perfect every time! Thank you so much for sharing this perfectly balanced recipe with us! Hi Tori! I had tried this recipe previously with 2% milk and it was wonderful! However, I’ve been cutting down on dairy and have been using coconut milk instead. I don’t have an automatic frother and for whatever reason it did not froth in the saucepan like the milk had the first time I tried it. Do you have recommendations for frothing non dairy milk in a pan? Or using a different kind of non dairy milk? I am not a huge fan of almond milk, but perhaps with the matcha the taste would not be as evident. I am also considering getting a handheld automatic frother in hopes that it would work better. Have you ever tried one of those? Thanks!!! Hi Emma! I use a Nespresso Aeroccino frother, which works really well for most types of non-dairy milks. I generally use organic almond milk in my lattes – I like unsweetened 365 brand from Whole Foods, it froths up quite nicely. Works great! You can also make froth by using this recipe… I didn’t fave a frothier… sooo, hope it’s helpful! That’s the best recipe of Matcha tea I have seen so far. I always start my day with matcha tea. Thanks for sharing. Mazal Tov on your new beautiful site, Tori! I love matcha lattes, and I purchased some of the tea. I’m wondering if the Epica Automatic Electric Milk Frother and Heater Carafe you have a link to is the frother/heater you use at home? If so, is it still working well? Hi Bethy! The frother I have is not available on Amazon, it was part of a Nespresso package I bought with accompanying espresso machine (they don’t sell the individual frother). However, the Epica frother does have lots of very good reviews on Amazon. If I were going to buy a separate frother I would definitely try this one based on the reviews. I have never heard of it either until I saw this recipe. There is no Trader Joe’s here, but a Starbucks in Kroger. I think Starbucks would be too expensive. I do like lattes. I finally found some. It’s moorish. 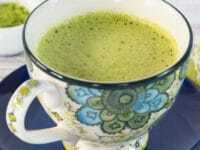 I was buyng one a day ; now i have my own Matcha tea to make up anyway i like. It’s nice in cakes too. It’s all the tea leaves which have been pulverised that we consume , nothing is thrown out. This is the only thing I order from Starbucks: non-fat, green tea latte, unsweetened..hot. Yum! The best is at Trader Joes!! There’s something about green drinks that just puts me off. Maybe because I’m a nurse…. This is so timely because I was JUST looking for quality matcha and didn’t have a good recommendation. Thanks! Love it, Coffee Bean and Tea Leaf has them also!! Someone wrote on my gym blackboard “everyone should use green tea matcha.” That was the first time I had heard of it. I guess it’s off the charts in antioxidants. It is! Very healthy, and in my experience it wakes me up without the jittery caffeine buzz of coffee. I still love coffee, but I’ve replaced a couple cups a day with matcha and I’m really enjoying it. I’m 100% off caffeine. Does it have any in it? Where do you buy it? Yes, it’s caffeinated Scott so maybe not the best option for you, but I will say that the caffeine in matcha seems far more “mellow” to me than coffee caffeine, not sure exactly why. Drink it all the time! ❤️❤️❤️ the teacup & saucer!